Back in vanilla was multiboxing a thing? Like, did many people do it? What kind of software were people using and what stance did Blizzard have on this contentious topic? I was thinking about who the first person to 60 on all classes in Classic would be and this popped into my mind for surely it will be a multiboxer who achieves this first. Probably the first to 60 on many servers will likewise be this due to the speed at which xp rich group content can be completed and begun with one player controlling. I’m personally okay with people doing it in PvE and solo play but really against it for battlegrounds. The perfect team coordination and focus fire is just too OP and ruins a good game for me! I would be VERY surprised if people managed to do it back then. Everyone had crappy frame rates with just one WoW.exe, let a lone 4 or 5. I tried to multi-box a few months ago, there are some softwares out there, but they are not free. There is one that kinda works and it's free, called "AutoHotkey", but you have to script everything by your self, it's not beginner friendly. Blizzard allows multi-boxing, but most private servers don't. I know a few players who plan to do that in the scenario they don't find a leveling partner. One individual specifically, plans to utilize 5 different characters at once until 60. The main thing I've heard is picking classes that would need limited inputs, that is, limited keys needed to be pressed in order to be efficiently used. It was surely allowed (more money for Blizzard after all :D) but I seriously doubt anyone was able to do that in 2005 for technical limitations. I kind of wish that it wasn't allowed by Blizzard. We're supposed to be playing the role of a character in Azeroth that adventures with and befriends others. Kind of misses the point of an MMO if you replace your leveling buddies with yourself. They did say something about being 'unsure' of addon development for Classic - this might indicate a stronger stance against multiboxing if it destroys the original feeling of the game as it was back then when, as people have said in this thread, it was technically challenging to multibox and there wasn't a lot of it. Huh, yeah. I hadn't really considered the addon side of things. The skeleton of Classic is running on a branch of the Legion client so addons could do all sorts of things that weren't possible back then. Guess we'll have to wait for time and Blizzard to tell us what will and won't be possible. Either way I can't wait to see what kinds of things people come up with that wasn't around in '05. But either way I just don't care much for multiboxing. Yeah it earns Blizzard more money but the whole thing just feels sorta slimey, in a vanilla or current retail environment. It just doesn't feel healthy for the game and Classic will, overall, probably be a bit for fickle of a thing on the economy side of things and I trust Blizzard will do the 'right' thing. I don't agree with the belief that multiboxing wasn't feasible in 2005... the software existed and the graphics/processing power too. Sure I can agree that not many people could use it but nonetheless it was still an option if you had the time and resources to invest in it. I don't agree with the belief that multiboxing wasn't feasible in 2005... the software existed and the graphics/processing power too. We're supposed to be playing the role of a character in Azeroth that adventures with and befriends others. Kind of misses the point of an MMO if you replace your leveling buddies with yourself. Personally, I have never been an advocate of multiboxing. It is something I consider cheating, and really shouldn't be allowed in Classic at all, but I doubt that is going to change anytime soon. I got like 20 fps in BC on my ‘Dell Inspiron’ laptop back in the day...if I had tried to open another client it would probably have melted. Wonder if minimum specs for Classic will be different to BfA - or reduced cos of old graphics/textures? Some of the graphics options are improved, like the amount of foilage clutter, as well as the water itself and shadows. I don't quite like it myself, for different reasons, but that is another discussion. There is a Classic option, however, which I suppose will reduce the workload a bit for your computer. Classic at "max" graphics will probably not be too different compared to what current World of Warcraft puts out. The only difference will be the updated textures, etc. I can't remember if drawing distance was in the Classic demo or not, since I did not participate in it. Just to input a bit from my recent experiences playing on a blizzlike - draw distances were there in Vanilla and for sure they will be there (albeit perhaps in a more modern UI setting) in the Classic client. I don't know whether that is in or will be in Classic. In retail, you can now see the world tree in Hyjal, in Vanilla you couldn't at all. Multi-boxing was a definite thing. Our Mage class leader back in the day multi-boxed 5 shamans and would go do pvp with them to great effect and fun. He used software to copy commands between each client. I actually used to tank and heal Molten Core at the same time on my warrior and wife's priest just by clicking between two windows (we were past bwl so gear made this a bit easier in terms of actions per minute needed). 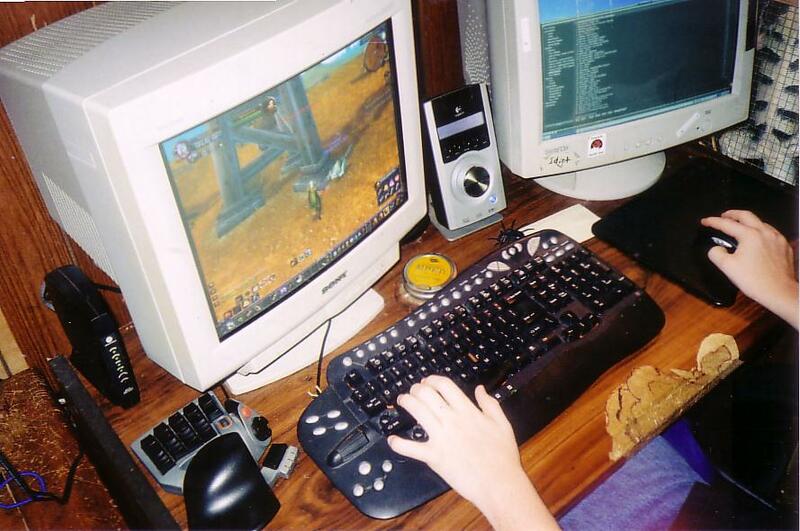 And, in terms of hardware, towards the very end of vanilla wow (november/december 2006), my roommate and I both upgraded to dual gtx 8800 graphics cards, and I remember us running 4 open windowed copies of wow at the same time just to see how awesome the graphics cards were. As I recall it, vanilla wow client didnt support crossfire or SLI in windowed mode though at the time, so chances are you only had actual GPU load on one of the cards and the other was idle. They even had issue letting the game client utilize several CPU cores since it simply didnt exist when the game engine was build and was brand new around its release. Anyone else used to dabble in this? I used to dual box in cataclysm, both shaman and hunter, but those where 2 of the same class and super easy to set up.. This time around I would probably want to dual box 2 different characters, considering that will give me better options for farming and running my other alts through dungeons. Anyone have done this in / on Vanilla wow servers? I will be checking this weekend on a repack, should prove useful regarding class choice and setup as I am sure Blizzard will allow multiboxing in Classic considering they have always allowed it. I multiboxed through the end of Burning Crusade and a lot of WotLK and beyond, with 2 or 3 characters depending on which characters they were. I would always group characters by range above all else, so Warrior/Enhance Shaman/Rogue, or Mage/Hunter for example. At the time, I used KeyClone to mimic button presses over clients, and had macros set up for follow and assist on the number pad. I think there was a time when KeyClone was flagged by Blizzard's anti-cheat, but I don;t think this is the case with the current version. Alternatives exist that are free and will work for sure, such as AutoHotKey, but this requires a bit more setup overall. I kept up multiboxing and transferring characters up past when Recruit-a-Friend became a thing (I think maybe in Cataclysm? ), when the benefits were even greater with the 15 minute teleport, 300% exp boost and the grantable levels, every pair of characters that I got to max level game me another 'free'. Perhaps you could recruit / refer a friend for something else? I'm really hoping that boxing doesn't become a thing here. If you go to EQ it's what they cater to and it ruins the game on every server with how it's done. They didn't allow a single person controlling multiple accounts using a single keyboard, you had to control every character. I really hope this stays the same and boxing isn't allowed. If you go to EQ it's what they cater to and it ruins the game on every server with how it's done. How does a person minding his own business and leveling up in peace ruin a game? I understand that people multiboxing on 40 accounts will have an impact considering world pvp, ganking and farming. But dual boxing for the sake of leveling and soloing should not have an effect on how other people play the game.